Tonight is New Year’s Eve and, for me, that’s kind of a big deal. You see, this is the first year since I’ve been of legal drinking age that I’m not employed as a bartender and thus, have the evening (and tomorrow, for that matter) to enjoy a tipple or two of my own! It’s snowing here now and I’m on my way out of the office, but I’ll be stopping into the grocery store to pick up some raspberries for this tasty delight. I suggest you give it a try yourself and toast to a happy, healthy New Year! Cheers! Muddle raspberries, superfine sugar, and fresh lime juice in a shaker. Fill the shaker with ice and add Leblon Cachaça. Shake vigorously. Strain into a champagne flute and top with Perrier Jouet. Enjoy! Ok, maybe they’re not “talking” per se, but they are communicating—with passers-by in real time. Imagine approaching a huge ad on the side of a building with a message that says “Hey you! Yes you, in the blue shirt.” It might just grab your attention, huh? Copy-writers will be engaging people, whom they can see via camera, by communicating to them in real time—very cool. Wouldn’t you love to be behind that camera, watching people’s faces contort with confusion as they realize the ad is talking to them? I can imagine the stages in this process. The unenthused passer-by quickly glances at yet another ad on the busy New York City streets. Passer-by slows to a stop to contemplate why the ad’s text “Hey You” is so random. “How’s that supposed to sell Jameson?” passer-by will think to self. After ad types “Yes, you,” passer-by will point to self and look around to see if anyone else is noticing. After ad types something more detailed like “you, in the blue shirt,” passer-by will look at his/her shirt to confirm that it is, indeed, blue. A look of shock followed by goofy smiling and unbelievable laughter will follow, while the passer-by attempts to tell everyone around about what is going on. A crowd gathers to join in the fun and everyone is late for work. It’s ok, it was worth it. Doug Winship over at the Pegu Blog, just did a write-up on his very different approach to the Hiram Walker Gingerbread Cocktail Competition. He may be a day late and a dollar short but he’s got one hell-of-a recipe to share (well, two recipes actually). When you think gingerbread, you think dessert, right? Of course! So, not only did Doug throw together a sweet & simple dessert sipper (which you can easily replicate for your holiday party, no excuses! 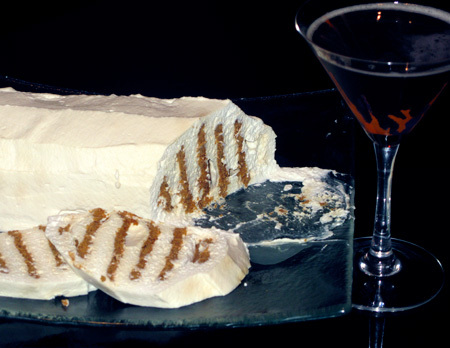 ), but he paired it with a yummy-looking treat (as in food) made with the Gingerbread Liqueur. The drink? Tony. The dessert? The Tiger. The recipes? I’ll give them to you here but make sure and click through to read the funny story about how they came to be. Check out his post for full instructions. They’re detailed but easy-to-do!